Every issue, landscape designer Darbi Davis digs deep to bring you stories for your outdoor space. 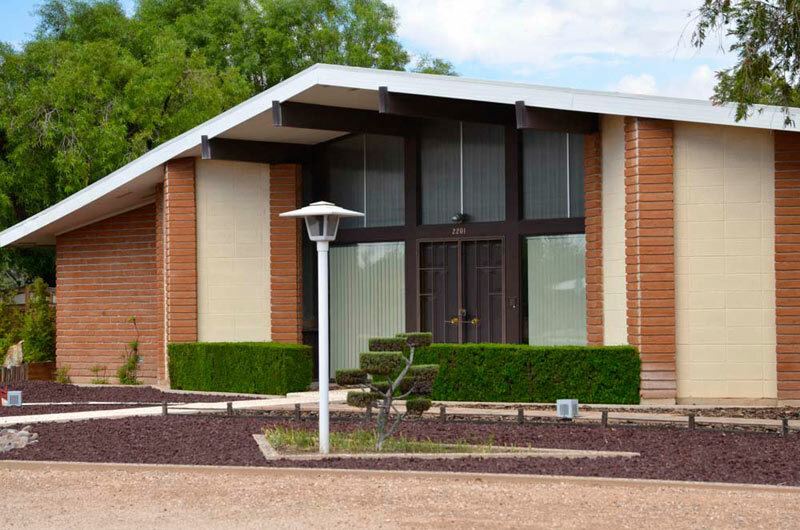 This month: how to spot a mid-century yard. 1. Inside/outside living: The gardens of atomic times were inspired by architectural styles that flowed inside to out. Material continuity, unobstructed views, geometric lines, shifts in elevation, and a connection to the outdoors were aesthetically essential. What was once a fireplace hearth on the interior projected straight out onto the patio and terminated as a planter box. The architecture, built in planters, plant cut outs, and historical plants. 2. Plants as architecture: Plants propelled architectural elements into the garden, forming living walls or partitions. An evergreen shrub was meticulously sculpted and maintained as a voluminous, boxy hedge for suggested privacy, while a large specimen plant made a statement, or became a landmark. Plants were sculpted into pom poms or plates, creating a visual interplay of mass and void and visually dictated direction or movement within the space. A hedge wall and pom pom’s lead to the front door. 3. Gardens were for the people: The Atomic times called for outdoor spaces that were comfortable and accommodated the average American family living in suburbia. Form and function were integral. 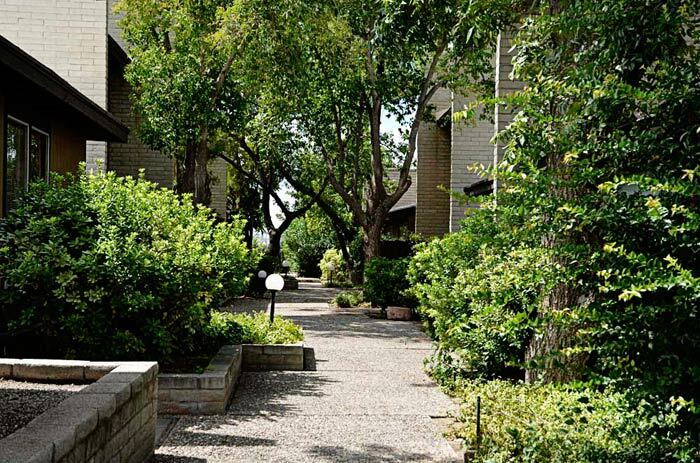 Hardscapes consisted of concrete, exposed aggregate or stone arranged in organic and/or angular geometric patters. Coupled with plants, their placement and form directed movement within the space, and established a scale that spoke to the comfort level of both children and adults. 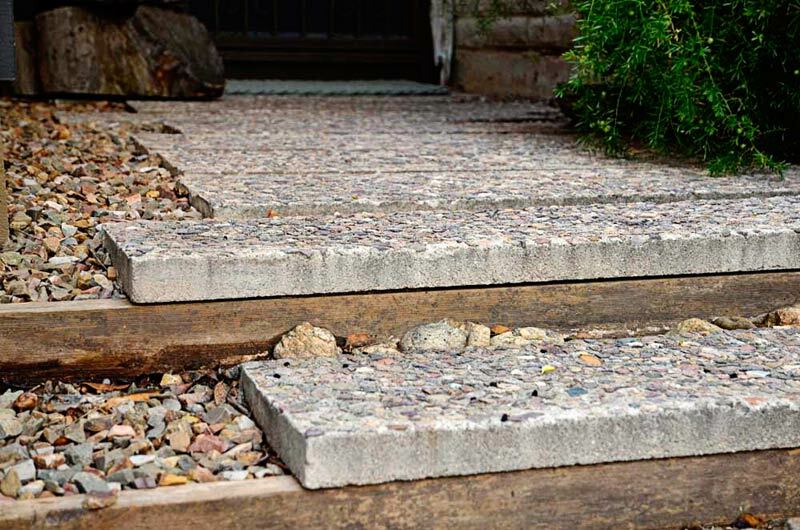 Exposed aggregate pavers are staggered to reflect the angles of the architecture, lead to the front door, and allow for edge plantings. 4. A limited plant palette: A typical mid-century landscape would be comprised of a few different plant species. In Tucson, trees such as Eucalyptus, Bottlebrush, Cyprus, Pines, Palms, African Sumac, and citrus created the classic vertical forms. Mock Orange, Pineapple Guava, Privet, Xylosma, Heavenly Bamboo, Natal Plum and Myrtle were planted in masses and sculpted into varying heights and shapes as architectural compliments. These sculptural plants create a vertical element in a Mid-Mod way. Don’t block the arches! 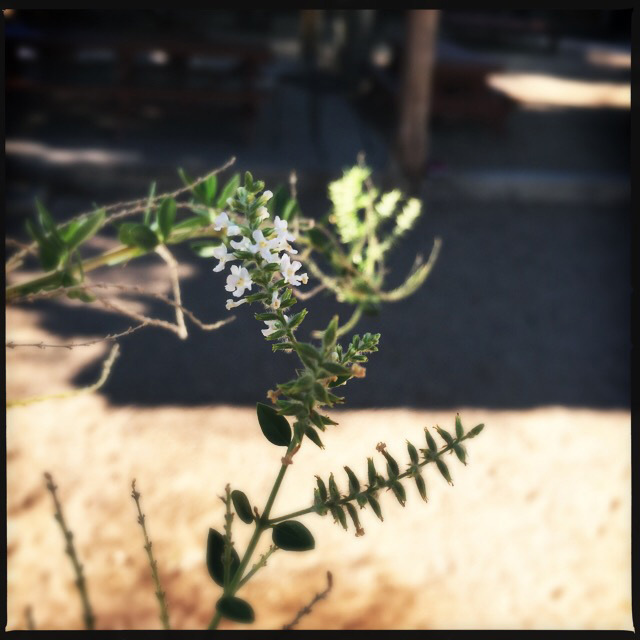 Specimen or Allee: Plant a Native Mesquite. Its lovely canopy looks stunning in an allee or as a multi-trunked specimen. Round or Sculpted: Use a Desert Spoon or one of our native barrel cacti. Don’t be a purist Many of the historical plants listed above are hardy and have adapted to our harsh climate – some like us too much (ahem, African Sumac) – and some require way too much water to look like they “like” where they live. So use naturally sophisticated natives. Many of our natives are simply sleek and allude to the vintage aesthetic. Vertical Element: Ocotillo and Mexican Fence post can offer a dramatic vertical element, while aloe and agave species can create a sculpted effect, or become the landmark. The hedge Similar to the social norms of the 1960’s, our local shrubs allude to a more hedonistic lifestyle. With the aid of power tools, Creosote, Little Leaf Cordia, and Leucophyllum species can be coaxed into a more streamlined shape or simulated structure. (Hedging any of these plants can be quite humiliating – to the plant – and I would never recommend it outside of this forum). Bee Brush smells divine and the flowers are adorable. A rough and tough plant has tiny leaves while one well watered has slightly larger ones. Place in a location where it’s easy to get your nose near the flowers!